The presentation editor from Google Docs has a new option that lets you insert tables. It may not seem too much, but Google's implementation is great and I hope that the table editor will be added the word processor, as well. 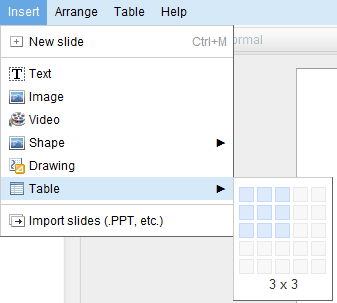 Instead of asking you the number of columns and rows, Google Presentations borrowed the simple cell selection menu from PowerPoint and made it better. Try to insert a 15 x 15 table and you'll see how Google Docs expands the table dynamically. 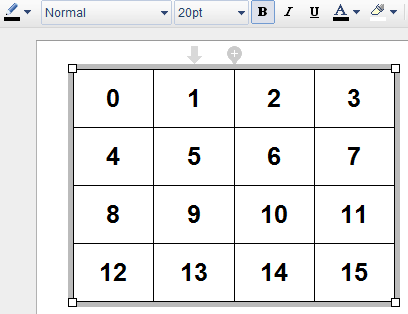 If you want to add more rows, you don't need to use the Table menu: just click on the "+" button next to one of the rows. Google Presentations added a similar button for selecting rows and columns. "Once you've inserted a table into your presentation, you can easily add, select, and resize rows and columns with a single click , format and align text across the table, and set background colors for your cells and borders. Your rows will grow to fit content as you type it. Collaborators can even make edits to the same table simultaneously. Now, when you import tables from Microsoft Office PowerPoint they'll show up as editable tables in Google Docs," explains Google. Another cool new feature is a play button for embedded presentations. If you click on the button, the presentation advances automatically to the next slide every 3 seconds. You can customize the number of seconds and there's also an option that starts the presentation after the player loads. All the options are available after you publish a presentation.